The following characters become unlocked in Classic mode when you play the indicated path. Sonic, Bayonetta, Mac, Ike, Luigi, Roy, Dr. Mario, Olimar. King K. Rool, Ice Climbers, Simon, Meta Knight, Snake, Young Link, Richter, Toon Link. Inkling, Wii Fit Trainer, Pit, Incineroar, Dark Suit Samus, Cloud, Wario, Dark Pit. Lucario, Marth, Ryu, Ganondorf, Lucina, Ridley, Chrom, Ken. Ness, Jigglypuff, Pac-Man, Zelda, Robin, Corrin, Lucas, Palutena. Villager, Shulk, ROB, Mega Man, Isabelle, Game and Watch, Pichu. Bowser, Pokémon Trainer, Rosalina and Luma, King Dedede, Sheik, Greninja, Diddy Kong, Duck Hunt. Captain Falcon, Zero Suit Samus, Peach, Falco, Daisy, Bowser Jr. Wolf, Mewtwo. Scanning in the indicated non-Smash Bros Amiibos will enable you to unlock the correspoinding feature earlier. Note: Different Amiibo that share the same unlock will unlock a duplicate spirit. Once you have beaten the World of Light for the first time you will unlock the ability to change the menu music. There are three different Mii Fighters to unlock. To do this though you have to actually create them yourself as opposed to encountering them after a Vs match or in the World of Light like other characters. Create your own Mii Fighter. This feature becomes unlocked when you have reached the True Ending in World of Light. You will then be able to enter New Game+ on your save file. All spirits and bosses return, making it a good way to earn more copies of spirits, and earning more skill spheres. 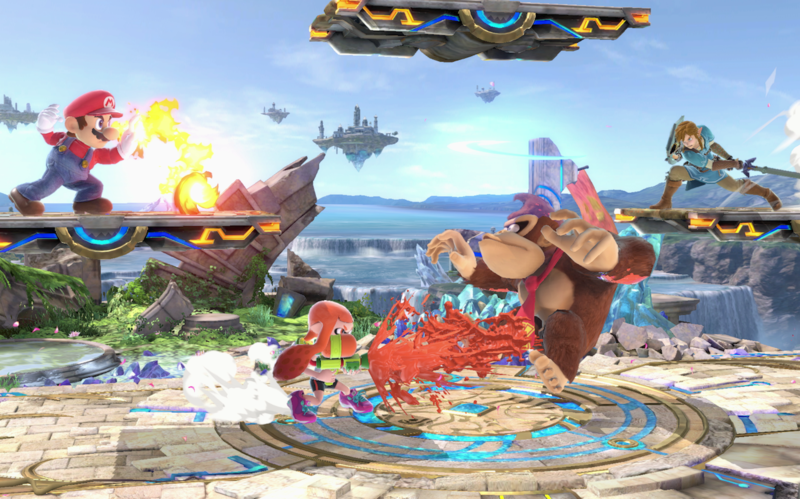 Whenever Sonic, Incineroar, Charizard, and the Inklings come into contact with water they will accumulate extra damage. The reason for this is that they are weak to water in their respective games. If you press 'Jump' and 'Attack' at the same time your character will perform a short-hop attack. This manoeuvre will push you off of the ground for a short distance while performing an aerial attack at the same time. Short-hop attacks can be vital to countering an aggressive opponent. A meteor smash is an attack that strikes opponents downwards. If you can perform one while the opponent is off stage attempting to recover it will send them straight down out of the blast zone for a KO. Final Smash moves are powerful finshers that are granted after breaking a Smash Ball. To unleash your characters Final Smash you must break a Smash Ball and then hit the 'Special' button (without tilting the left stick in any direction). The only way that you are able to unlock new characters is by winning the Challenger Fights. If you fail in a Challenger Fight you can always retry by going to the 'Games and More' section and looking out for a glowing door in the bottom righthand corner. This door will give you the opportunity to rematch and unlock the character you previously lost against. Listed below is the definitive order that the characters unlock, regardless of what method you use to unlock them.